Can't Do Squats? Quad Workout To Make Your Thighs Bulge! When you can't perform squats to make your legs grow, don't lose hope! Use this quad workout that focuses on foot position to pack on muscle to your thighs! Anyone that has been training for longer than a day has seen the guy that has the enormous upper body and the toothpick legs. You have also seen all the jokes made about guys like this on the forums, in magazines and comics all over. I saw 4-or-5 guys like that when I started training and I swore that would never be me. I had knee injuries growing up, fractured both ankles from playing basketball, and was diagnosed with Osgood-Schlatters disease as a teenager. I didn't care. I wanted big legs. I knew that the squat was THE exercise that I had to do in order to achieve leg growth. Arnold did them, Platz did them, and I will never forget seeing Ronnie Coleman squat 800 for a double in his video. I wrapped the knees and went for it. I squatted until I could barely stand. I did other exercises of course, but squats were in every routine I did. Close Stance, Sumo, and every foot position in between. I got to where I could squat over 400 pounds, which I was very proud of considering where I started. However, now that I have been training for a decade, and have more wear and tear on me, squats have proven to be more difficult to do. Also, I wanted to focus more on quads specifically. I had to find an alternative, even though I hated the thought of not doing squats anymore. The routine that I am going to reveal is what I found to be the best routine for quad growth I had ever done since I gave up squatting. If you have been training for less than one year, or if you are someone that has just now taken leg training seriously, then I suggest continuing a basic routine until you figure out how to isolate a muscle properly. This routine is more for intermediate lifters and even advance lifters that could use a change in their routine. Also, this routine is higher in volume than you are probably accustomed to. For those of you that intend to do this routine, make sure quads are the only thing you do in the gym. DO NOT do hamstrings or calves. Set those muscles aside to train another day in the week. To be safe, wait at least 48 hours before doing anything lower body again. You will need to recover properly. How Often Do You Work Your Quads? I'm not concerned about working my quads. As 2006 Masters World Champion and Pro Bodybuilding Weekly host Bob Cicherillo will tell you, opposites work in bodybuilding. That theory is what we practice with this leg program. Close foot position works the outer quads and wider foot stances focus on the inner thigh area. This can be applied to every muscle you train, but that is for another article. Let's stick to quads for now. First, you warm up your quads and knees with 2-3 sets of 15-20 reps with single leg extensions. You really want to be warmed up when doing this. Go light and slow so you can prepare the thighs for the beating you are about to give them! Now, we are going to start with the leg press. 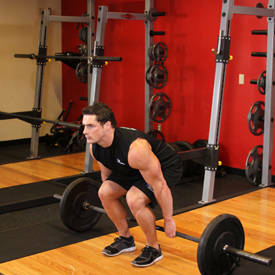 Load up a weight that you can do for 20 repetitions. You are going to place your feet at a close stance. Close to shoulder width should do it. Now go for 10 reps. 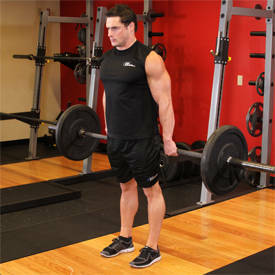 When you complete the 10th rep, change your foot position to a wide stance. As far wide as you can comfortably go, then immediately do 10 more. Once you have done that, rest for a minute and add weight. This time you are going to go for 16 total reps. Eight close, eight wide. Rest for another minute and add more weight. Now you are going to do 12 total reps. This will be six close and six wide. After you finish with the final set, stretch out your quads and move on to the hack squat. This time, you are going to choose a weight that you can do for 30 reps. Another difference is this time you start with your feet in the wide stance. Perform 15 reps and change to the close foot position. Perform another 15 reps for 30 total. Add weight while you rest so that the next set is for 24 total reps. 12 wide followed by 12 close is the protocol this time. Another minute rest and then you add weight for 20 total reps. This set will be 10 wide and 10 close. At this point, you have only done two or three warm up sets and six work sets, but since your foot position changes each set, it is comparable to doing 12 work sets! Make sure you keep stretching and flexing your thighs in between sets and exercises. We are moving on to the final exercise. We are going back to leg extensions. This time though we are doing them with both legs. You start this exercise with close foot positioning. You are going to set the weight at something you can do for 40 reps. 20 of these are close and 20 wide. Rest for a minute or two and perform one more set the same way with the same weight. Finish stretching out your legs for a few minutes after this and you are done for the day! Only eight working sets, but it feels like 16! More Tips To Help The Quads Grow! As you are doing these exercises, change where you point your toes to hit the muscles a little differently. Point them outward, point them toward each other. Don't just have them pointing straight up every time. It is amazing how this little difference makes such a big impact on your quadriceps. Also, in this routine, I had you do the leg press with the close stance first. Next time, start with the wide stance first. Do the same with hack squat and leg extension. Change which foot position you start with on each exercise on each workout. Although I concur about the greatness of the squat, clearly there are alternatives to make your legs grow to levels you will be proud of. If you can't do the squats for some reason, or you want to shock your quadriceps into new growth and stimulation, give this routine a try for 6-to-8 weeks and be astonished as your thighs grow and your confidence to wear shorts grows with them!